21st QM Truck Regiment 36th QM Battalion 373 QM Truck Co.
39th QM Battalion 3305 QM Truck Co.
108th QM Battalion 3309 QM Truck Co.
45th QM Truck Regiment 45th QM Battalion 3461 QM Truck Co.
68th QM Battalion 3465 QM Truck Co.
120th QM Battalion 3469 QM Truck Co.
159th QM Battalion 3312nd QM Truck Co.
472nd QM Truck Regiment 82nd QM Battalion (Mobile) 3727th QM Truck Co.
472nd QM Battalion (Mobile) 3721st QM Truck Co.
Battalion assignments unknown: 3724th QM Truck Co.
478th QM Truck Regiment 88th QM Battalion 3848th QM Truck Co.
516th QM Truck Regiment 3d QM BN, 516 QM Reg 3930th QM Truck Co.
On 1 December 1943 the regiment was redesignated as the 21st Quartermaster Group, under the command of Lt. Col. E. C. McCallum, and the Battalions, Mobile respectively. Companies "A" through "M" were redesignated as the 3301st through 3312th Quartermaster Truck Companies and followed separate lineages. The defunct regiment's headquarters and medical detachments provided personnel for the formation of a Headquarters and Headquarters Detachment and Medical Detachment for each of the battalions. On 1 December 1943, the 45th QM Regiment was broken up and the units were redesignated. The 45th Quartermaster Truck Regiment became the 45th Quartermaster Group with the 1st Battalion redesignated the Headquarters and Headquarters Detachment, 45th Quartermaster Battalion, Mobile and the 2nd Battalion became 68th Quartermaster Battalion, Mobile. The Companies A through M were also redesignated to numbered companies and followed separate lineages. The 45th QM Group embarked from the Karachi Port of Embarkation, Karachi, India, on 4 November 1945 and disembarked at New York Port of Embarkation. The unit was once again inactivated on 26 November 1945 at Camp Kilmer, New Jersey. 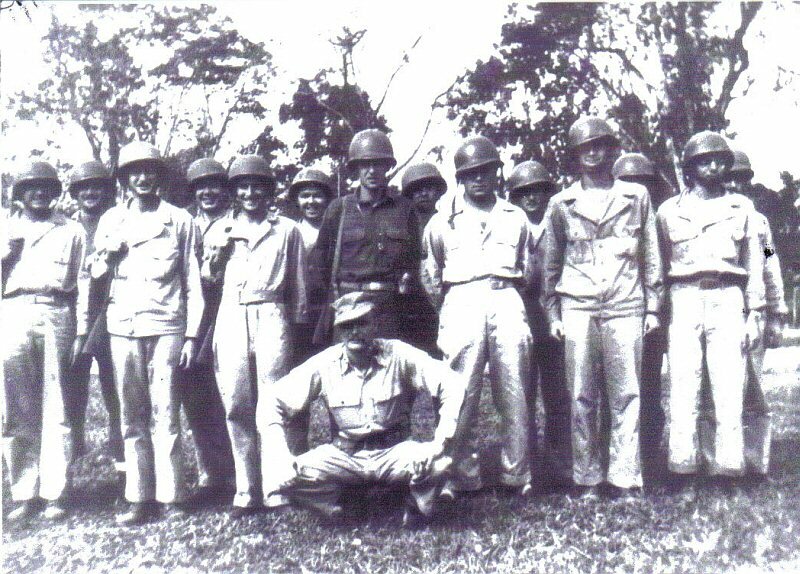 Meritorious Unit Commendation: 15 Jan-15 Jul 45, GO 136, Hq SOS USF China Theater, ltr undated. On 1 December 1943, the 21st Regiment was reorganized and its three battalions were redesignated as Headquarters and Headquarters Detachment (HHD), 36th Quartermaster Battalion; HHD, 39th Quartermaster Battalion and HHD, 108th Quartermaster Battalion. The lettered companies, E through H, were redesignated 3305th through 3308th Quartermaster Truck Companies respectively and assigned to the 39th Quartermaster Battalion. Description: A gold color metal and enamel device 1 1/8 inches (2.86 cm) in height overall consisting of a gold palm tree leafed green and terminating in anchor arms at the base, all in front of and extending above and below a black circular band bordering a white-capped green mountain peak rising on a brick red disc; superimposed across the black ring, extwined over the rims and passing behind the upper tree truck a horizontal gold scroll double-looped over the right rim bearing the inscription "WE'LL CARRY YOU" in black letters. Symbolism: Brick red and golden yellow are colors used for Transportation. The organization's World War II campaign awards for service in the India-Burma and Central Burma areas are commemorated by the snow-capped mountain for the hauling of supplies over many treacherous mountain roads near the Tibet border; the palm tree and anchor indicate the many inland waterways traversed in Burmese transportation. In addition, the palm tree and anchor together with the black ring, symbolic of the wheels of motor transportation, denote the battalion's port activities in the Republic of Vietnam. The color green also alludes to Vietnam service. Background: The distinctive unit insignia was approved on 1 June 1967. Shield: Gules (Brick Red), an Indian elephant head caboshed, ears displayed Or, tusked Argent, jessant an anchor throughout of the second cabled and stocked proper; between two truck wheels of the second tired Proper. Crest: On a wreath of the colors, Or and Gules (Brick Red), a mountain Azure capped Argent surmounted by an anchor bendwise sinister Or, debruised by a palm tree bendwise Proper. Shield: Brick red and golden yellow are the colors of the Transportation Corps. The anchor stands for inland waterways of Burma and the port duty of the unit's Vietnam tour. The elephant alludes to World War II service when elephants were used extensively to aid loading trucks and aircraft in the Burma-India Theater. The truck wheels are symbolic of transportation. Crest: Buff and blue are the colors of the Quartermaster Corps from which the 39th Transportation Battalion is descended. The ultramarine blue mountain refers to the terrain of Burma. The palm tree refers to Vietnam service and the anchor is a traditional symbol of the Transportation Corps' mission of loading and off-loading at debarkation ports. Background: The coat of arms was approved on 4 September 1992. The parent unit of the 36th Transportation Battalion (Truck) was the 1st Battalion of the 21st Quartermaster Regiment (Truck-Corps). It was constituted in the Regular Army on 1 May 1936 and redesignated on 8 January 1940 as the 21st Quartermaster Regiment (Truck). The 1st Battalion of the 21st Quartermaster Regiment (Truck) was activated at Fort Benning, Georgia on 15 January 1942. The 36th Quartermaster Battalion, Mobile remained in the CBI Theatre until August of 1945, a total of 29 months, most of which was spent in the jungles of Central Burma, especially around Myitkyina on the Tirap River. In that time, it had under its command for various periods, the 3301st, 3302nd, 3303d, 3304th, 3312th, 3502nd, 4390th, and 373d Quartermaster Truck Companies; the 4276th Service Company; the 4294th Railhead Company; and the two detachments (HQ and medical). It was temporarily attached to the 45th Quartermaster Group from November 1944 to March 1945 and to the 468th Quartermaster Group from 9 April to 11 June 1945. On 1 December 1943, the 21st Regiment was reorganized and its three battalions were redesignated as Headquarters and Headquarters Detachment (HHD), 36th Quartermaster Battalion; HHD, 39th Quartermaster Battalion and HHD, 108th Quartermaster Battalion. The original lettered companies of the 2nd Battalion, E through H, were redesignated 3305th through 3308th Quartermaster Truck Companies respectively and assigned to the 39th Quartermaster Battalion. From then on the companies and battalions would follow separate lineages. The 45th Corps Support Group (Forward) prepares for worldwide deployment, and when directed, provides combat support and combat service support for military operations. The 45th Corps Support Group (Forward) was originally constituted on May 1, 1936, in the Regular Army as the 45th Quartermaster Regiment (Truck). It was initially activated on May 9, 1942, at the Oakland sub-port of embarkation, California, as the 45th Quartermaster Truck Regiment. Elements of the regiment separated on December 1, 1943, and received new destinations. The Headquarters and Headquarters Detachment became HHD, 45th Quartermaster Group. The Headquarters and Headquarters Detachment, 1st, 2nd and 3d battalions became Headquarters and Headquarters Detachment, 45th, 68th, and 120th Quartermaster Battalions (Mobile) respectively. Companies A through M were redesignated as the 3461st through 3472d Quartermaster Truck Companies. The Headquarters and Headquarters Detachment, 45th Quartermaster Group, then deactivated at Camp Kilmer, New Jersey, on November 26, 1945. On March 30, 1966, the Group was designated as Headquarters and Headquarters Company, 45th Support Group. Activation followed on May 4, 1966, at Fort Lee, Virginia. The Group was deactivated on December 15, 1970, at Fort Lewis, Washington. 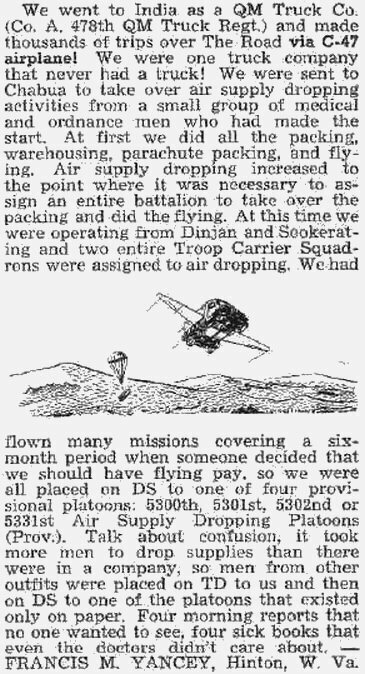 On September 15, 1972, the 45th Support Group saw its latest activation at Fort Shafter, Hawaii. In August 1986, the 45th Support Group was reorganized to include command and control of the 7th Maintenance Battalion, the 124th Transportation Battalion, the 84th Engineer Battalion (Combat)(Heavy), the 29th Engineer Battalion (Topographic), and the 125th Finance Battalion. On October 16, 1993, the 45th Support Group was redesignated as the 45th Corps Support Group (Forward), the 7th Maintenance Battalion was redesignated as the 17th Corps Support Battalion, and the 124th Transportation Battalion was redesignated as the 524th Corps Support Battalion. The 68th Corps Support Battalion was constituted 1 May 1936, in the Regular Army as Headquarters, 2nd Battalion, 45th Quartermaster Regiment. On 1 April 1942, it was redesignated as Headquarters, 2nd Battalion, 45th Quartermaster Truck Regiment. On 1 December 1943, the 45th QM Truck Regiment was broken up and the units were redesignated. The 45th QM Regiment became the 45th Quartermaster Group and the 2nd Battalion became Headquarters and Headquarters Detachment, 68th Quartermaster Battalion, Mobile. The lettered companies were also redesignated to numbered companies and followed separate lineages. Meritorious Unit Commendation: 1 Jan-30 Jun 44, GO 44, Hq SOS IBT, dtd 25 Feb 45; 1 Jul-31 Dec 44, GO 93, Hq SOS IBT, dtd 9 May 45. * Meritorious Unit Commendation: 1 Jan -30 Jun 44, GO 44, Hq SOS IBT, dtd 25 Feb 45; 1 Jul-31 Dec 44, GO 93, Hq SOS IBT, dtd 9 May 45. Meritorious Unit Commendation: 13 Apr 43-Feb 45, GO 220, Hq USF IBT, dtd 27 Sep 45. Meritorious Unit Commendation: 15 Jan-15 Jul 45, GO 136, Hq SOS, USF China Theater, ltr undated. NOTE: This section lists Battalions whose Regimental assignments are NOT identified above. NOTE: This section lists Companies whose Battalion assignments are NOT identified above. Meritorious Unit Commendation: 9 Dec 44-30 Sep 45, GO 6, Hq USF IBT, dtd 5 Jan 46. 961st QM Co has been active since WWII. The unit has served in Korean and Iraq, and is currently based in McAllen, TX. While during WWII the Company helped deliver much needed petroleum products, its mission as the 961st QM Co (Water Supply) is water treatment, storage and distribution. Attached to Base General Depot No. 1, India-Burma Theater at Karachi, India. 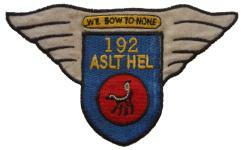 Later attached to 380 Air Service Group for rations, quarters and administration. Activated at Santa Maria AAB, CA 25 Mar 43. All-Chinese unit. Stationed at Luliang, China by Jan 45 with detachments operating on other bases in China. Unit moved from Chanyi, China to Tsingchen, China Jun 45. Activated at Barksdale Fld, LA, 1 Apr 43. Arrived at Ondal, India 1 Jun 44. Activated at Greenville Army Air Base, SC on 1 Apr 43. Detached from 54th ASG c. Nov 43 though shipped to Casa Blana with 499th Serv. Sq. Rejoined 54th ASG c. Jan 44. Unit stationed in India and has detachments in Sylhet, Fenny and Chittagong, India by Jun 44. Activated 1 Apr 43 at Santa Maria AAB, CA. Unit at Salua, India by Sep 45. 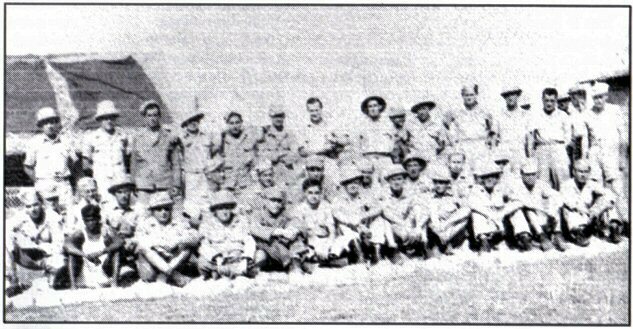 Unit at Dudkhundi, with detachments at Piardoba, Salua and Kalaikunda, India by Oct 45. Pictured is the 1084th Q.M. Company, a group of wonderful, hard working men. I was the Section Chief of Property. The officers were Capt. Gallagher, Lt. Bright, Capt. Stock and Lt. Miller. I left Calcutta on the Marine Wolf in Jan. 1946 through the South China Sea; docked in California on Feb. 8, 1946. Activated as a Detachment at Morrison Field, West Palm Beach, FL, Sep 41. Went overseas to India 13 Mar 42, later having supply detachments in Karachi, India and Kunming, China. 25 Sep 43, was redesignated as the 114 Quartermaster Company Service Group (Aviation). Redesignated 1100 Quartermaster Company Service Group (Aviation) 9 May 43. Stationed at Chabua, India by Sep 43. Activated as Detachment 3, Quartermaster Company Supply (Aviation) c. 1 Jun 41 at Baton Rouge Air Base, LA. Redesignated Detachment 3, Quartermaster Company (Supply Aviation) , 1 Apr 42; 186 Quartermaster Platoon Service Center (Aviation) 22 Apr 42; 186 Quartermaster Company Service Group (Aviation) 14 Aug 42; 1139 Quartermaster Company Service Group (Aviation) 15 May 43. Unit left for overseas duty 21 Sep 42 in the Middle East. (Transferred to CBI, date unknown.) Relocated from Hsingching to Shanghai, China. Movement order received 29 Nov 45; final preparations made for embarkation. Activated 1 Quartermaster Company Supply (Aviation) at Langley Field, VA 3 Jun 41. Redesignated: 189 Quartermaster Platoon Service Center (Aviation) 25 Apr 42; 189 Quartermaster Company Service Group (Aviation) 29 Jul 42; 1142 Quartermaster Company Service Group (Aviation), 16 May 43. Unit left Newport News, VA 6 Oct for overseas duty. Location India, 15 Dec 42. Detachments at Karachi, Chakulia. Unit inactivated 9 Feb 46. Originally designated the Detached Second Quartermaster Company, Supply Aviation. Company located Kanchrapara, India. Moved to Chengtu, China in Feb 44. Company transferred to Luliang, China 16 Jun 45. Meritorious Unit Commendation: 1 Nov-31 Dec 44, Hq 68th ASG, dtd 5 Apr 45. Activated 1 Sep 40 Tampa, FL. Renumbered from 747 QM Truck Co per WD AG 320.1 (8-28-42) Letter, Subject: Redesignation and Reorganization of Quartermaster Companies, Truck, with the Army Air Forces, Sep 12, 1942. 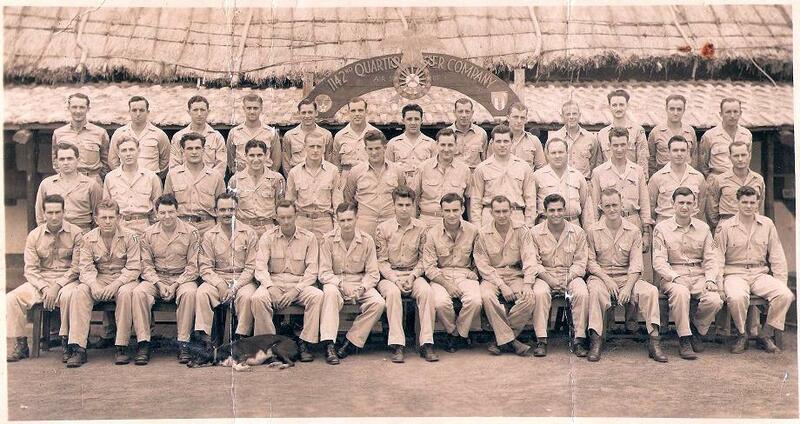 Meritorious Unit Commendation: 20 Mar-20 May 44, GO 31, Hq IBT Air Svc Cmd, dtd 27 Mar 45. Activated 6 Mar 41 Barksdale Field, LA. Served in Middle East, then to India. Renumbered from 752 QM Truck Co per WD AG 320.1 (8-28-42) Letter, Subject: Redesignation and Reorganization of Quartermaster Companies, Truck, with the Army Air Forces, Sep 12, 1942. Renumbered from 765 QM Truck Co per WD AG 320.1 (8-28-42) Letter, Subject: Redesignation and Reorganization of Quartermaster Companies, Truck, with the Army Air Forces, Sep 12, 1942. Located at Piardoba, India -Jun 44. Unit disbanded 30 Jun 44. Activated as 771 Quartermaster Company (Truck) 9 Mar 42 at Savannah Army Air Base, GA. Renumbered 19 Sep 42 from 771 QM Truck Co per WD AG 320.1 (8-28-42) Letter, Subject: Redesignation and Reorganization of Quartermaster Companies, Truck, with the Army Air Forces, Sep 12, 1942. Stationed at Ondal, India. Unit deactivated 19 Jan 46. 773d Quartermaster Company (Truck) activated 13 Mar 40 at Key Fld, MS. Assigned to 301st Serv Gp 15 Aug 42. Moved to Selfridge Field 15 Oct 42. Renumbered from 773 QM Truck Co per WD AG 320.1 (8-28-42) Letter, Subject: Redesignation and Reorganization of Quartermaster Companies, Truck, with the Army Air Forces, Sep 12, 1942. Departed for Calcutta, India 18 Aug 43. Reassigned c. 20 Sep 43. Unit located near Deoladie, India. Constituted 17 Feb 42 as 792nd QM Co., activated 25 Feb 42 at Gowan Field, Boise, ID; redesignated 8 Dec 42 1980th QM Truck Co, Avn per WD AG 320.1 (8-28-42) Letter, Subject: Redesignation and Reorganization of Quartermaster Companies, Truck, with the Army Air Forces, Sep 12, 1942; Left 21 Sep 42 for foreign duty in the Middle East. Moved to India & China first half of 44. Inactivated 6 Jan 46 at Ft Lawton. Redesignated 1980th Transportation Corps Truck Co 1 Aug 46; redesignated 251st Transportation Truck Co 19 Apr 48; activated 29 Sep 48 at Kenton, OH; redesignated 251st Transportation Co 2 Jun 53; moved 17 Sep 02 to Saginaw MI. Activated as Company "I", 30th Quartermaster Regiment, at Moffett Field, CA 1 Jul 40. 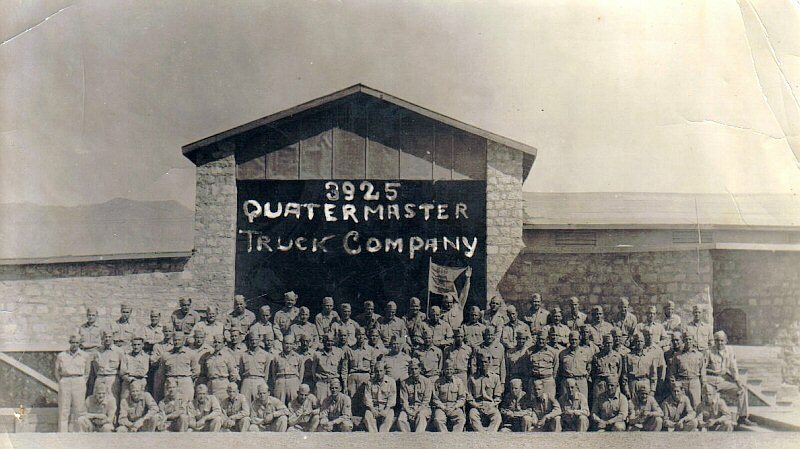 Redesignated 803d Quartermaster Company (Truck) 2 Feb 42. Redesignated 1989th Quartermaster Company Truck (Aviation) 19 Sep 42. Went overseas to Kweilin, China 30 Jan 44, with detachments at Kunming, Yangkai, Chanyi, Tsuyung, Chenekung and Yunnanyi. Activated as Company "D", 33 Quartermaster Company (Truck) 10 Jan 42 at Williams Field, Chandler, AZ. Redesignated 28 Sep 42 1991 Quartermaster Company (Truck). Went overseas to Sale Air Base, French Morocco and then to Otherwise Air Base, Montesquieu, Algeria. Unit moved from Catania, Sicily to Foggia, Italy Nov 43. Unit moved from Italy to Corsica Apr 44. Moved to CBI date unknown. Renumbered from 822 QM Truck Co per WD AG 320.1 (8-28-42) Letter, Subject: Redesignation and Reorganization of Quartermaster Companies, Truck, with the Army Air Forces, Sep 12, 1942. Transferred from Myitkyina, Burma to Pandaveswar, Madhaiganj area, India c. fall 1945. Inactivated 24 Dec 45. Organized as Company "D", 32 Quartermaster Regiment at Napier Field, AL 3 Dec 41. Redesignated 828 Quartermaster Company Truck 10 Jan 42. Renumbered 19 Sep 42 from 828 QM Truck Co per WD AG 320.1 (8-28-42) Letter, Subject: Redesignation and Reorganization of Quartermaster Companies, Truck, with the Army Air Forces, Sep 12, 1942. Went to Ondal, India, arriving 8 Jan 44. Unit Deactivated 14 Jan 46. Activated as Company "G", 32 Quartermaster Regiment Truck at Maxwell Field, AL 15 Nov 41. Redesignated 831 Quartermaster Company (Truck) 10 Jan 42. Renumbered 19 Sep 42 from 831 QM Truck Co per WD AG 320.1 (8-28-42) Letter, Subject: Redesignation and Reorganization of Quartermaster Companies, Truck, with the Army Air Forces, Sep 12, 1942. Went overseas to Jorhat, India 22 Sep 43. Deactivated 24 Dec 45. Activated as Company "B", 34 Quartermaster Regiment at Kelly Field, TX 19 May 41. Redesignated 838 Quartermaster Company (Truck) 10 Jan 42; Renumbered 3 Nov 42 from 838 QM Truck Co per WD AG 320.1 (8-28-42) Letter, Subject: Redesignation and Reorganization of Quartermaster Companies, Truck, with the Army Air Forces, Sep 12, 1942. Went overseas to Camp Howrah, India, near Calcutta, 29 Jan 44. 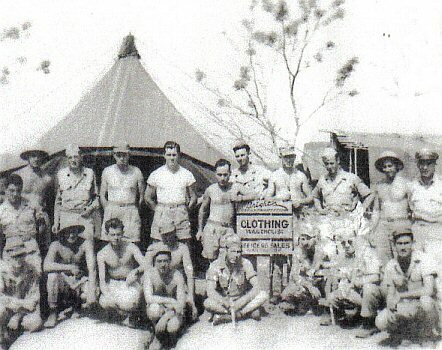 Company went from Calcutta to Chabua, India c. Mar 44. Renumbered from 846 QM Truck Co per WD AG 320.1 (8-28-42) Letter, Subject: Redesignation and Reorganization of Quartermaster Companies, Truck, with the Army Air Forces, Sep 12, 1942. Unit located at Piardoba, India by May 44. Unit inoperative as of Dec 45. The 192nd Assault Helicopter Company's crest was designed and drawn by Major Smith, then the Company XO, and Warrant Officer Tidey. It was conceived by Major Smith, who drew the basic desired design, and then turned the final work over to Warrant Officer Tidey. The crest was completed and presented to Major Baker, the Company Commander, who approved it in early September of 1967. All of the major items of the crest were chosen for a significant reason. The shield was chosen to represent our offensive as well as defensive capabilities. The "flying white horse" represented the unit's task upon arrival in Vietnam: the aerial support of the Republic of Korea's "White Horse" Division. The buttressed line dividing the top and bottom portions of the shield was selected for its heraldic portrayal of an embattlement. It was thought to be very appropriate to incorporate such a symbol into the crest since the unit was to leave for Vietnam in early October 1967. The colors used in the crest were also chosen for a symbolic meaning. The teal blue and gold are the colors of Army aviation. The black was chosen as it represented our night flying capabilities, the white for the "White Horse" Division. The motto "WE BOW TO NONE" was selected to depict our stated ambition and professional competence to equal or surpass those who are "ABOVE THE BEST". Activated 1 Jan 43 at Santa Maria Army Air Base, CA. Left 9 Nov 43 for overseas duty in India. Move from Calcutta, India to Chungking, China, in Apr 45. Activated on 1 Apr 43 at Barksdale Field, LA. Activated 1 Apr 43 at Syracuse Army Air Base, NY (55 Service Gp); Transferred overseas to Army Air Base Chanyi, China effective 28 Feb 44; Company composed of Americans of Chinese ancestry. Unit personnel trained Chinese Air Service personnel in motor transport skills at Chihkiang, China. Unit disbanded, starting on 10 Aug 45; personnel transferred to other organizations. Activated on 1 Apr 43 at Dale Mabry Fld, FL. Stationed at Charleston AAB, SC (56 Service Gp) -unknown. Transferred to Tseyung, China Feb 45. Unit assigned to Peishiyi, China Apr 45; unit moved in convoy on 27 May 45 to Enshih, China. Unit prepared to move to Kunming, China Jul 45. Activated 1 Apr 43 at Santa Maria AAF, CA (61 Service Gp) -unknown. Elements of the unit in Burma, India and China Mar-May 45 (Nawadih, Shamshernagar, Chittagong, Cox's Bazaar). Unit moved to Peishiyi, China Jul 45. Unit elements moved to Chinkiang, China Aug 45. Organization located at Hankow, China, in preparation for return to the United States; moved to Shanghai, China to board transport home on 17 Nov 45. Unit deactivated at Camp Stoneman, CA on 8 Dec 45. Activated on 1 Apr 43 at Santa Maria Army Air Base, CA; moved unit to Pendleton Field, OR on 10 Dec 43. Unit moved to Shinching, China Sep 45. 1 Provisional Quartermaster Truck Company was redesignated 2257 Quartermaster Truck Company (Aviation) 22 Apr 45 at Herbert Smart Airport, Macon, GA. Unit is manned with colored personnel. Unit at Warazup, Burma after leaving India on the Ledo Road (drove over the Hump c. Apr 45.) Unit moved to Namponmao, Burma. Worked with the 4 Combat Cargo Group Jun 45. Unit moved back to India from Burma and was deactivated 24 Dec 45. 2 Provisional Quartermaster Truck Company was redesignated 2258 Quartermaster Truck Company (Aviation) 22 Apr 44, at Herbert Smart Airport, Macon, GA. Manned with colored personnel. Went overseas to Shingbwiyang, Burma. 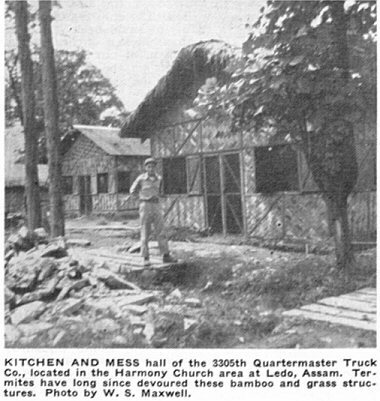 Unit moved to Ledo (Lekhapani), India from Shingbwiyang, Burma 8 May 45. Unit at Chabua, India c. Aug 45. Activated at Herbert Smart Airport, Macon, GA 22 Apr 44. Unit stationed at Ranaghat India c. Sep 45. Unit was inactivated 16 Mar 46. Activated 15 Mar 43 at San Bernardino, CA. Organized 16 Apr 42 at Patterson Field, OH. Tinker Fld, OK (22 Air Depot Gp) -unknown. Unit assigned to China-Burma-India Theater May 45. Unit scheduled to move to China Jun 45. Activated 21 Mar 42 at Duncan Field, TX. Stationed at Pinecastle AAF, FL (45 Air Depot Gp) -unknown. Activated at Macon, GA 9 May 42. Unit moved to the front where battle of Tunis developed. Transfers to Burma-India Theater. Transferred from 329th ASG to 14 ADG. Unit in Shanghai, China by Jan 45. 4588th QM Base Petroleum Supply Co.
Lineage and Honors Information as of 10 February 2005. Activated 18 Apr 42 at Duncan Field, Texas. Traveled up the Yangtze River and the Whangpao River to reach Shanghai, China Nov 45. Went overseas to Townsville, Australia arriving 19 Jun 43. Went from there to Iona, New Guinea and on to Kiriwina island. Move to CBI date unknown. Assigned to 14 ADG. Became the Quartermaster unit of the Shanghai Air Depot.